När jag väntade på bussen innan idag gick en gubbe runt och delade ut lappar. "When the disciples saw Jesus ascend into heaven following His resurrection, two angels told them, This same Jesus, who was taken up from you into heaven, will so come in like manner as you saw Him go into heaven. Scripture is clear that Jesus will return to earth. So given this truth, how should we conduct our lives until He does? the Apostle Peter said that we ought to be in holy conduct and godliness, looking for and hastening the coming of the day of god. The first step is to recieve Jesus in to your life as savior. It is not possible to be in holy conduct and godliness without having a relationship with Jesus. If we truly have a relationship with Him, we will be looking for His return. 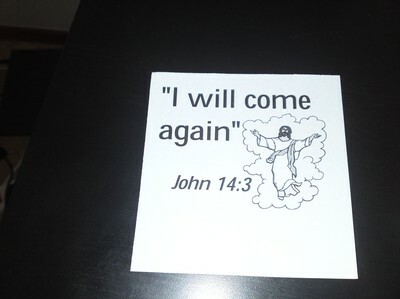 He gave us signs to watch for and said that we can know when His return is very near. We may also hasten the Lord's return by obeing Him and working to spread the gospel." Okej Enligt denna text så kommer jesus att återuppstå mest eftersom att det står att någon säger det i Bibeln. Nu: Made in Sweden Sen: Naptime! Om det är han jag tänker på så brukar han gå runt så. Jag tror att han är jehovas vittne eller något men att han inte kan språket eller liknande.